Larry and Sharon Duncan are the ultimate vivacious couple. They were both reared in Fresno, married some 33 years ago in Maui, have two children, and have traveled all over the world since—some for business, some for pleasure. Larry is Chairman & CEO of Duncan Ceramics, which has manufacturing plants in Clovis, as well as China. Larry’s grandmother started Duncan Ceramics in 1946. Since then, they have significantly broadened their product line to include over 4,000 craft, ceramic, and DIY products, with their trademark of beautiful, fired colors. Their products are now sold worldwide. Larry goes to China several times a year for business and has been to most of the major cities there. The Duncans usually travel with family and a few friends—the more the merrier! For the long flights, Sharon prefers, “first class, so one’s coherent when you land.” And don’t ask her twice about going to Italy, France, Maui, or Nashville. Sharon has a sister with connections to Exclusively Resorts membership. The homes are massive, with at least 6-8 master bedrooms and bathrooms, and are oftentimes on the grounds of resorts and 5-star hotels, almost always on hillsides overlooking the stunning scenery. At these posh homes, they often hire private, local chefs to cook for them. Their Italian vacation is one of the most memorable for the Duncans. Their group started in Tuscan country, where they visited San Gimignano and the Chianti Valley, which is known for its picturesque rolling hills covered with vineyards. Eventually they made their way through Florence, Sienna, and Rome, where they toured the Roman ruins, Saint Peter’s Basilica, and the Vatican. In France, the Duncans once rented three 350 year-old chateaus within walking distance to one another to accommodate all the friends and family that traveled with them. One of their favorite memories is of going to the local market there to shop for meats, vegetables, et cetera for cooking back at the chateaus. The Duncans enjoyed experiencing the many restaurants that lined the streets of Italy and France, where there is an abundance of champagne and red wine. The Italian people were very welcoming, especially at the small town markets. Turns out they didn’t see any operas in Italy because Larry says he’d fall asleep. “But we did see Phantom of the Opera in New York!” Sharon added. Of all the places they have traveled, Costa Rica was one of Larry and Sharon’s favorites. There they rented an exclusive home, in a gated area, complete with private beaches. Sharing the trip with friends and family, and being within walking distance of great shopping and fantastic restaurants, made the experience truly memorable. They even rented a yacht one day. It sailed to a cove, where, on an exclusive beach, a private chef prepared a gorgeous luncheon of crab, chicken, and salad. Larry, being an avid scuba diver, found out from the local scuba guide a week later that an 18-20 foot salt water crocodile was spotted sunbathing in the exact same place their beach party took place. Sharon said that had she known that croc was lurking in the waters then she might not have enjoyed the experience so much! Getting to Hawaii makes Sharon nervous, since one must fly over open water and there is obviously no place to land in an emergency. “Maui is worth the flight,” said Sharon of the place she and Larry tied the knot over 30 years ago. They still love to stay at the Grand Wailea Resort, and are game for Hawaii any time of the year (except September, when it is a bit too humid). While Larry “eats to live, Sharon lives to eat.” But they both love trying new restaurants. Visiting Si Señor, the famous establishment in Puerto Vallarta, was one memorable dining experience. Now, Jeff Ruby’s Steakhouse in Nashville is quickly becoming a favorite place to dine. And for that after dinner drink: Dierks Bentley’s Whiskey Row. Speaking of Nashville, the city is the Duncan’s new favorite place to visit and explore since their daughter, Summer, is dating country music star Jon Pardi. The couple has two children, Hawk, 31 (who works alongside Larry at Duncan Enterprises), and Summer, 29, for whom their Summer Hawk Ranch is named. At their ranch, there is a plethora of animals—zebras, emus, horses, baby goats, and a rainbow of doves (colored with Duncan dyes) are some of the highlights. Sharon takes care of the morning feeding, while Larry feeds in the evening since Sharon is usually cooking dinner then. On a personal note, it is easy to see that the Duncans are just crazy about each other; they love doing things together, and enjoy even more just being with one another. 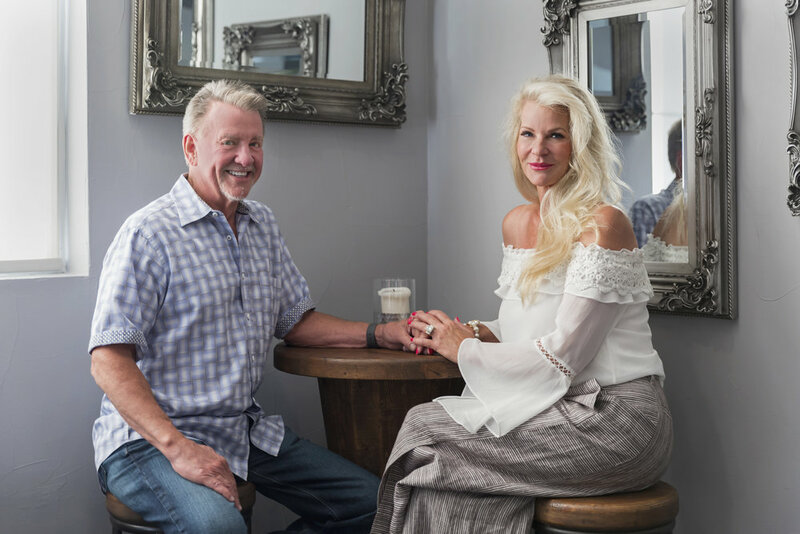 They are two beautiful people, inside and out, and you have to admire their energy and excitement when talking about their children, their travels, their experiences, and their life at Summer Hawk Ranch.